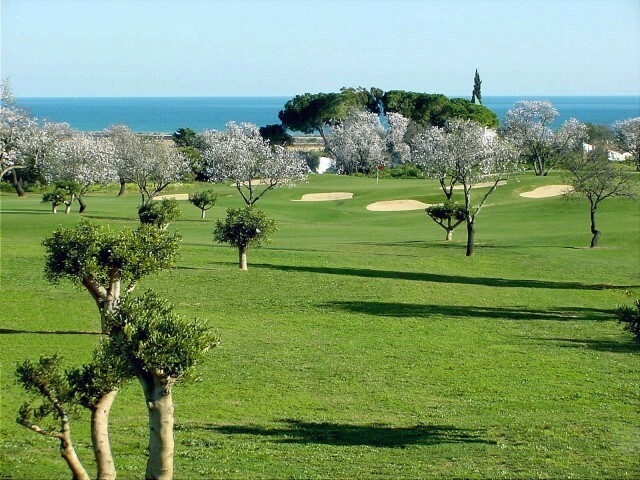 Please select a date of play to check availability on Quinta da Ria. 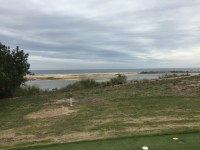 Rocky Roquemore as the course architect has taken advantage of its beautiful setting in a Nature Reserve with the blue sea as its southern boundary. A first hole of 475 meters is a par 5 and sets the style of the course by taking the player down a gentle slope to the first of many undulating greens. The par 3 fifth hole of the Quinta da Ria Course is a challenging dogleg to the left with a water hazard to catch the short ball. The home nine takes the player close to the beach providing panoramic sea views. The interesting par 4 fourteenth of 333 meters is another dogleg to the left and presents water to the right on the drive, and then again inviting water to your left to carry on the approach shot to the green. The broad fairway of the eighteenth par 5 of 475 meters brings the player to a tricky green which is almost surrounded by its protecting bunkers. Nice course to play, with ocean views on several holes. Layout on the first 9 compact at times - we heard 'fore' a lot. Fairways were in pretty good shape. Greens were in good condition, but the areas just outside the greens alternated between clumps of long grass and rock hard dry spots. This is not terrible, but could be better. With the course fully booked, we had 5 hours to finish. This is an absolutely stunning course - and one we can't wait to play again. My husband and I played here in August. We were both very impressed with the course. It's so nice to play off grass fairways where you can get a divot, and not the tightly knotted spongey grass that we have experienced on some other golf courses here in Portugal. It's very challenging in parts, with plenty of hazards to keep you on your toes. It's a very picturesque course with beautiful shrubs, trees and amazing bird life. We were grateful for a couple of extra shots as a result of the handicap adjustment. We were disappointed that the club house was out of action as it's undergoing a refurbishment - due to be completed mid October. We're looking forward to returning to play again in early October with a crowd of friends - and we're hoping you can get the clubhouse finished by then!! 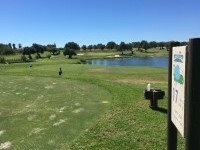 The first course that I have played in Portugal and I was impressed with the layout with a mix of relatively straightforward holes and some really tough ones usually involving water. The greens were very good and if I was being picky, they could have been slightly quicker. A really nice touch at the beginning when my son and I were given a cold bottle of water each when we were given the buggy.